The TopZero London Sink adds the perfect modern touch to any kitchen. Enhance your kitchen’s style with this large, stainless steel sink by TopZero. Like all TopZero sinks, this kitchen sink is rimless and modern. 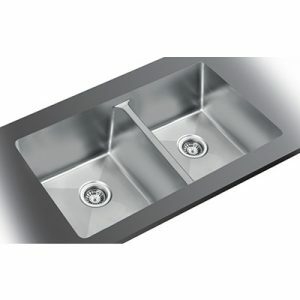 This sink is made with 304 stainless steel and finished with attractive satin. The modern kitchen is not complete without the modern kitchen sink, and when you want the ultimate modern kitchen sink, there’s no better option than this sink by TopZero. TopZero sinks are made to be rimless, which adds the perfect modern touch to your kitchen, but also prevents grime and scum from building up around the rim. Additionally, this sink is aluminum coated and comes equipped with sound absorbing pads for a quieter, more serene kitchen environment. Since this is a double sink, it makes it easy to keep your kitchen clean and organized.